Seiko celebrate this year the 55 year history of Grand Seiko, is of course the foundation on which its present success is built but it is also the key to its future. Since its creation in 1960, every Grand Seiko watch has shared the same commitment to the pure essential of watchmaking. Precision, legibility, comfort and durability are the attributes that have always defined Grand Seiko and always will. Because of these cherished and long held values, Grand Seiko’s history is a source of rich inspiration for its designers and the Grand Seiko Historical Collection is the result. 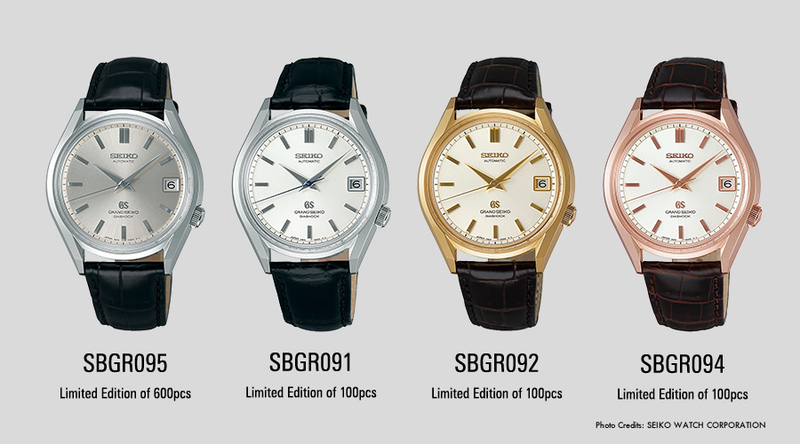 In 2013, the 1967 44GS was recreated, in 2014 it was the turn of the 1964 “Self Dater,” and in 2015, Grand Seiko returns to 1967 and to its first ever automatic watch, the 62GS. Caliber 9S65 drives the re-creation models. One is in steel and the others are in different shades of 18K gold. The lion emblem on the case back, the dial layout, the distinctive hour markers and the dial logotypes (notably “Diashock”) are all inherited from the original 62GS.